Working in collaboration with the venues creative director and the interior designer we sought to create an intense multi-layered club atmosphere with its own unique identity. Dark blue and black shades dominate the textured brick walls whilst rich gold and bronze metallics offer luxurious contrast. In the lighting design we sought to create an architectural scheme to bring warmth and colour to these elements whilst using the distinctive design forms as inspiration for the technology layout. 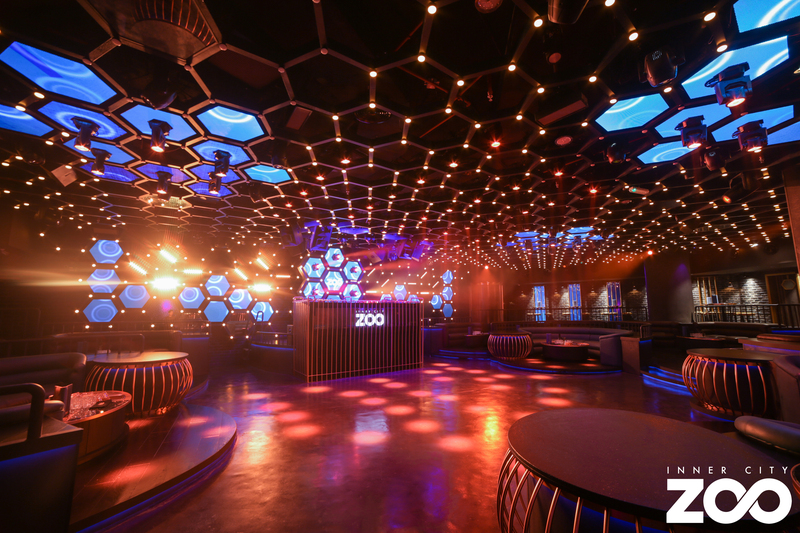 The overall DNA of the club came from the name “Inner City Zoo” – an urban jungle concept – something wild, unleashed and edgy. In exploring the animal textures the design team evolved a honeycomb hexagon structural pattern that provided a matrix for lighting and video elements. 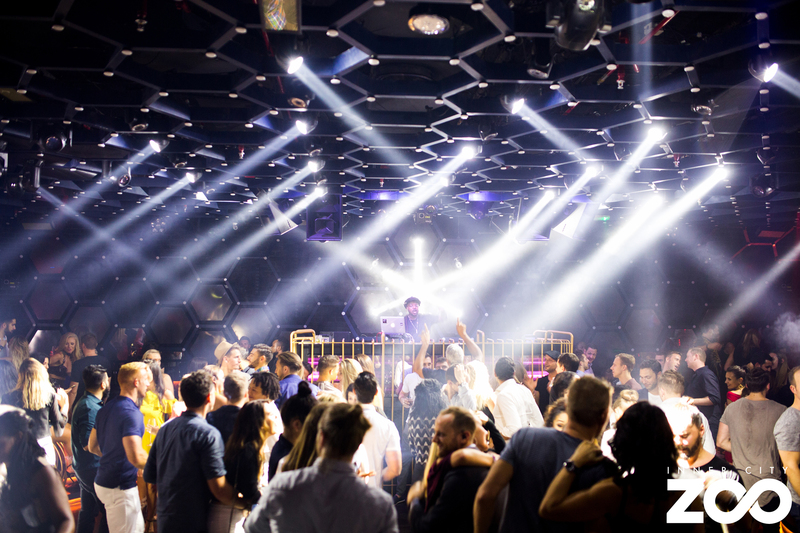 This dominates the roof in a custom metal framework and informs the design of LED screen panels, pixel “nodes” and the formations of lighting clusters above the VIP booths. 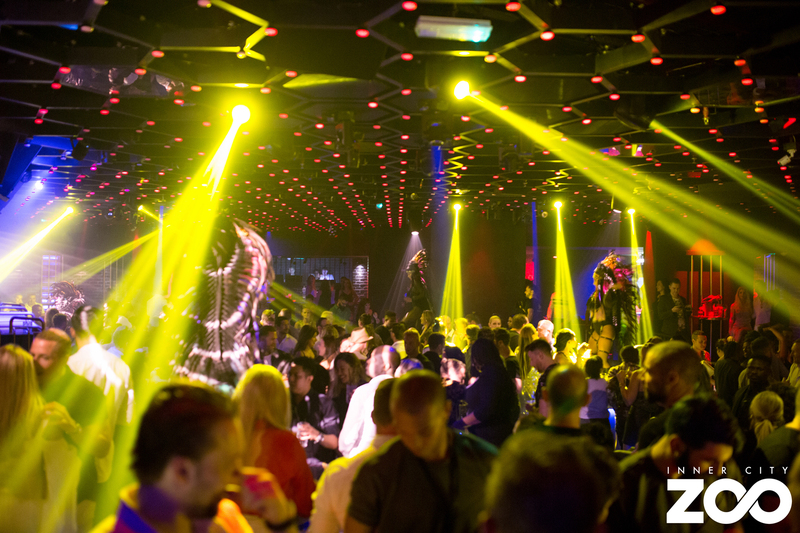 Principally based around LED fixtures the lighting design was considered as layers of light – allowing the resident operator to be able to shift between pixel, gobo, beam effects and laser throughout each evening. Designed to be utilised by one operator for lighting, video and lasers we assembled an integrated control solution using the MA2 platform linked with MA VPU, Arkaos, Madrix and Pangolin software to maximise the flexibility and dynamic of the system with quick hands on access in the form of an MA2 Light console. The use of a high end control surface was integral to ensuring the venue can continue to evolve the visual dynamic and the operators can build their own individual shows without compromise. With both power and maintenance a factor as well as the impact of requiring a lot of air conditioning due to the middle eastern climate the choice of fixtures was predicated on using LED based light sources for all of the architectural lighting and 90% of the show lighting rig – including some new high power LED strobes. With a low ceiling in place we wanted to get as much texture and depth to the atmosphere as possible. With a blend of architectural lighting merging into the show lighting every single element of illumination in the venue is controlled by the lighting operator making for a fully immersive experience in every area. The placement of LED screens, lasers, show lighting fixtures and mirrors on the walls and ceiling expanded the canvas of the venue. The Glasson led pixels used to create the roof matrix uses standard 2 core mains cable and ES mount lamp fittings which are linked to the Glasson power supplies. This made the system easy to install and maintain whilst achieving the dynamic range required for this large pixel canvas. The lasers from LPS delivered a compact and highly efficient solution driven by industry standard Panoglin software. Further special effects are in the form of vertical smoke jets from Magic FX, Hazers from Hazebase and CO2 Guns with backpacks for the venues resident dance team to utilise. Control and infrastructure are elements we consider paramount to the sustainability of a venue. We based the system around the artnet protocol alongside the MA2 Net making it robust, reliable and easy to scale for future developments. We also deployed specialist LED dimming from Eaton / iLight for the architectural fixtures allowing retro feel, warm white dimming of filament LED fixtures with maximum efficiency. Finally in control we used the LSC power relay racks for all lighting hot power – meaning we can monitor incoming voltage and power consumption for the system as well as having easy DMX control to power up and down the complete system at the touch of a button. Using artnet merge functions we have the potential to blend content between the Arkaos Media Server, Madrix Pixel Control and MA VPU solutions allowing a completely integrated lighting show control with colour and animation generated from multiple sources including real time effects. The creative delivery of this project was achieved alongside the operations team to ensure that the systems would be robust and reliable for daily use. We embraced robust touring power and data management solutions in the core infrastructure alongside leading control platforms.